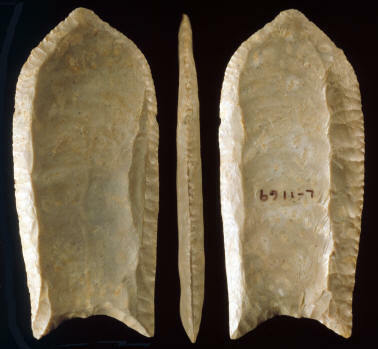 This Folsom point was found in 1977 on a southwestern Missouri farm in Barry County. 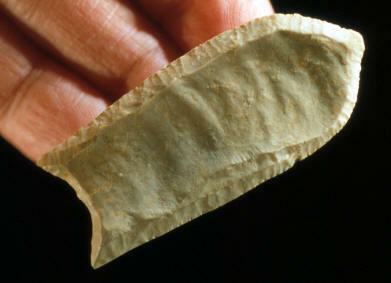 It represents a “classic” example of a fairly rare, complete example, of this Late Paleo projectile point form. This Folsom point was found at what is generally considered the eastern area of distribution. The majority of all Folsom points and sites have been found in the Plains states from Texas to Canada and from the Rocky Mountains to Kansas and Oklahoma. In comparison, very few examples have been found east of the Mississippi River. This Folsom point is fluted to the tip on both sides. The flutes are very wide. The widest is ¾ of an inch (1.9 cm). The edge has been trimmed with very fine pressure flaking that is typical on the most skillfully made Folsom points. This Folsom point is made of local chert from southwest Missouri. One ear and a portion of one edge have been restored. It measures 2 1/4 inches (5.7 cm) long, 7/8 inch (2.2 cm) wide and 7/32 inch (5 mm) thick. This picture shows three views of the original Folsom point. One ear and part of one edge has been restored. This Folsom point is made of local chert from southwest Missouri. It measures 2 1/4 inches (5.7 cm) long, 7/8 inch (2.2 cm) wide and 7/32 inch (5 mm) thick.